Three weeks of Peru have resulted in a long text and over 60 pictures - we hope you are currently relaxing in the sofa - or a bit bored at work - to tackle this sandwich (or sanduch as they write here). 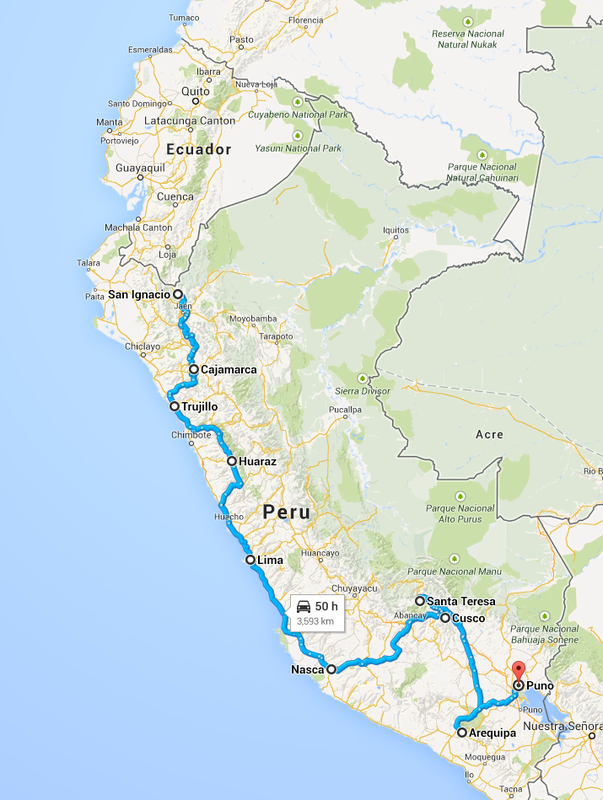 A quick point on our stay in Peru: First, there is a lot of driving to do here, the distances in the north are quite large, although the majority of the roads are in a good condition. Second, the country is very touristic and also pretty expensive and Peruvians like to charge you for everything. In addition the country has a very strange climate, and there is no real consistence in the seasons. Did we enjoy it? Of course, we met great people, saw incredible places and as always, we have been surrounded by beautiful views. Still, we were maybe expecting even more and we left Peru with a bit of a mixed feeling - this also had to do with our last activity, a visit to the Uros islands at lake Titicaca. So what did we do? If you remembered, we left Ecuador via a back road, entering Peru via more or less a back road as well (although the road was better at the Peruvian side). Being in the middle of nowhere we pass by beautiful landscapes. Apparently you can find rice fields in this area of Peru. One of the first stops we did were the ruins of Kuelap, a fort of the Chachapoyas culture. Often compared with Machu Picchu, the ruins are very impressive, although not at all like MP. The quantity of stone being used to make the platform on which the fort was build is enormous - some have made comparisons to the pyramids of Egypt. From there we head direction Cajamarca via a crazy road. Our guidebook advised us that the whole road would be unpaved. We are surprised to see that it had been paved. Now, after having driven there we had wished that it had unpaved: the road is extremely narrow and has hundreds of suicidal 180 degree turns. As the road is paved, everybody drives like a maniac. During the long road we maybe passed five cars, and each time we were afraid to crash with them. Anyhow: we survived and could relax at the Baños del Inca nearby Cajamarca (although we had to move the car at five in the morning from the public parking because we were parked on somebody his fruit juice stand). A bit of history: at this spot the Inca was relaxing when he knew the Spanish arrived. Being in the mountains for a while, and driving a lot for five days, we looked forward to going to the coast, where we made camp at Huanchaco for some nights to relax. This touristic village is popular as it's nearby the ruins of Chan Chan and it has long waves for the surfers. Some say you can ride a wave for kilometres there. The place itself was not special, the ruins of Chan Chan on the other side were. First you have the fact that it was an Adobe complex - made of sand, something which is very available here. Only one palace is visitable, the nine others are now part of the dune landscapes and the main road is even ruining straight through them. Nearby you have the city of Truijllo, which has a nice centre and a horrible rest of town. At this point it should be noted that the average small Peruvian villages are extremely ugly and it is by far a priority of the inhabitants to decorated the place a bit. From the coast we start to climb into the Andes again. We go direction Huaraz passing by the Cañon del Pato. The road is amazing and has over 50 tunnels and dozens of bridges. In the middle of the Cañon we need to stop: road works. The road is open during the lunch hour and as it is eleven in the morning and there are 100 Peruvians who had nothing to do the VanBaelenGuillot museum opened. Everybody received a tour and no questions were off limit. It is always funny to have these moments. From the cañon we drive up to a beautiful high in the cordillera, Lago Paron. Nobody there except an extremely friendly caretaker and the glaciers surrounding us for at least 270 degrees. Huaraz was the next stop, but we only treated ourselves on a great meal in a belgian chef Restaurant! The weather was bad and it was raining, this area has some excellent trekking but it was just not the right moment. We descend from the mountain to go direction Lima. The city of Lima is a great summary of Peru in general: it is a country of extreme contrast. Driving towards Lima we see people living in the worst conditions so far, houses or tiny and the surroundings are not friendly - all of Peru's coast consists of dessert. There we met Juan's dad (friend from Belgium), who had some presents sent to us by Alex family. The centre of Lima, or at least the place where we were staying, was luxurious and people had all comfort. The area of Miraflores was packed with new apartment buildings which were all so classy - you don't even have that at a lot of places in Europe in our opinion. So, not having visited Lima, we cannot say much - Miraflores was nice though. We also met Marita, a friend from university of Mireia. Our next stop would be the village of Nazca, famous for its giant lines. As the drive is long, we first stop in the national parc of Paracas, located next to the beach, it has some nice cliffs. Nearby here there are the Islas Ballestas, home to many seals and lions. Mireia decided to do this trip alone, while Alex took care of some things at the same time. She returned enthusiastically from the trip. The island is packed with seals and pinguins and where the seals normally eat the penguins they are good friends here. It is suggested that the seals have plenty of food in the water so they don't need to feed on miny penguins. So continuing to the famous Nazca lines we did another mini break. This time we stopped in the village of Huacachina to enjoy the dessert in another way. Here you can take a cheap dune buggy tour. The buggy we drive with was an old Nissan Patrol, stripped down to the chassis and build up again with a roll cage. Pretty fun experience to be flying over the dunes and to make things better we went to sand board here as well. In the beginning we thought it would be stupid, but it turned out to be more fun than expected. So finally we were ready to go visit the Nazca lines and we were going to do it in style. For Mireia's birthday we decided to take the 30 min flight over the lines. The small cesna accommodated two pilotes, us two and two other gringos. All and all an experience which was worth it, even flying in the cesna was already fun enough! From here we went to the Inca capital, Cusco, an excellent city to visit and a great place from where to visit other sites in the sacred valley - the valley which has many different Inca ruins. The city of Cusco is really worth a visit, even if it has been remodelled by the Spanish. Many Inca walls still stand and show the amazing stonework that they have done. On top Cusco is one of those places where there is a campsite which attracts lots of travellers, which is always fun as well. Our first ruins to visit from Cusco is the magical city of Machu Picchu. We decided to go the cheapest way possible, meaning to take the car to Santa Teresa and walk next to the trainrails towards the village of Aguas Calientes, housing all the touristic facilities for the visit. We had the great pleasure to have met a family from Lima, the Velaochagas, at the campsite of Santa Teresa with who we could do the journey till Aguas Calientes. It turned out to be a great experience for us to learn more about Peru and about the region. After sleeping a night at Aguas Calientes we woke up early to go to Machu Picchu. We spend the whole day wondering around, climbing the Machu Picchu mountain and enjoying the spectacular views around us. It was a real dream coming true for us, even if we were warned that the place gets crowded - hey, it's okay, there are only 3000 visitors allowed per day and the site is large, you really don't walk over the heads! After completing this 'bucket list' activity we continue to visit a bit of the sacred valley. The village of Ollantaynambo, charming on its own, had some ruins as well, somehow a bit similar to the more famous Machu Picchu. Also the agricultural terraces of Moras were spectacular and showed some insight into the Incas. There main goal with these places was to develop and perfectionise seeds to allow better crops around there empire. Nearby the latter we visited the saltpans at Salinas, located in a pictureperfect valley. A salty stream coming out of the mountain is diverted into thousands of saltpans, large shallow pools where the water can evaporate, leaving the salt behind. Our last visit in the sacred valley before heading back to Cusco were the ruins at Pisac. Equal as the rest we already had our dosis of Inca ruins and were not that impressed and headed back to Cusco. By now the many hours driving are starting to way on us and we are somehow looking forward to Bolivia and Lake Titicaca to relax a couple of days . First we would go to Arequipa, the second largest city of Peru and famous for its monastery. Driving here we did a small pitstop at the Cañon de Tanajini, where we slept and enjoy the amazing night sky and day views. This small cañon receives little visitors and has something American about it - you could imagine Lucky Luck riding his horse here. Another 'must do' tourist attraction is the Cañon del Colca, at places twice as deep as the Grand Canyon. After having seen many nice cañons we were not impressed by the cañon itself. On the other hand we were very happy to see condors, the biggest flying birds, here. From the Cañon we headed direction Puno, the touristic centre of Lake Titicaca on the Peruvian side. From here we did a visit to the islas Uros, which are very famous as they are floating islands made by the locals in the time of the Incas. The main goal was to be in peace from them, ironically the people are living mainly from tourism nowadays and we were a bit disappointed with our visit. Peru was a strange country to visit, with many extremes. For us it was not exactly as we expected it to be anyhow. PS: For those checking our blog regularly, sorry again for the big delay in posting, the internet in Bolivia is not great. On the other hand the country itself is a complete surprise! More on this in a week or so! For this we need a dune buggy! This brings you up and you can come down yourself - more fun than we originally thought! Where a salty stream is diverted into thousands of saltpans. When the water is evaporated, salt remains. Where we are reminded that we are tourists like anybody else! Hey guys, really awesome to follow your posts. I like the idea of the mobile museum. Biggest tourist attraction! Take care! Hi Marcus! Great to hear from you and to see you are reading and enjoying our blog! The mobile museum is a continues must for the locals and always a big success among all nationalities!! Hi Eneco! We are advancing pretty good, no? Hopefully you'll go to Spain one day and we can see each other there!! Say hi to Iker and Mikel!